You can use your business’s brand assets to your advantage. Before creating or making adjustments to your business’s brand image, know your brand assets — what can contribute to the value of your potential brand. 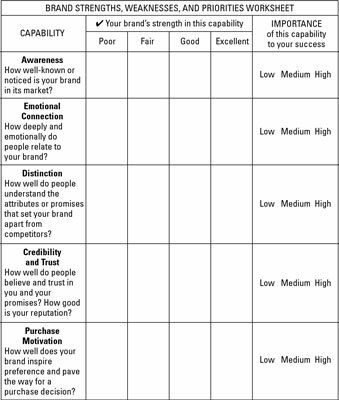 The worksheet in this figure can help you assess your brand assets. As you enter your assessment of each asset, base your answer on your own opinion and on the opinions you collect from those in your company and customer base. Turn to professional researchers for help if you’re positioning a brand that will have significant range and value in the future. The resulting brand asset analysis allows you to decide which elements of your brand have significant value. These are the assets that you should keep or evolve in future brand realignments. The analysis also uncovers which assets have little recognition or regard — those assets can go by the wayside with little or no loss of brand strength or value.